The bending is complete and the rear legs have been drying in my drying closet for about a week. I always check the moisture content before removing the legs from the forms. In this case the legs have dried to about 8 or 9% moisture content so I remove them from the forms. I’m now ready to begin the post bend shaping. When this is complete the legs will be ready for cutting the slat mortises. The bending process almost always introduces some twist in the leg. If you remember from the post on preparing the rear leg blanks for bending, the width front-to-back is 1-5/8″ and the width side-to-side is 1-7/8″. The extra 1/4″ side-to-side is there to allow me to mill out any twist that is introduced during bending. To begin I need to evaluate each leg in order to choose the best side to joint flat. I have found that one side generally pivots in the center of the leg and that the opposite side, although not flat, tends to be more stable with points at each end touching the bench top. This photo shows the side of the leg that pivots in the center. This side is facing down on the bench top and you can see that the center touches the bench top while both ends of the leg rise above it, especially on the right. The next photo shows the same leg flipped over to the other side. As you can see, that although it is not entirely flat, it is pretty close. This is the side I will joint, mainly because it already much closer to flat and it will be much more stable passing it across the jointer. I don’t normally clamp the leg to the bench top to evaluate it for flatness, but I needed some way to hold it in place so that I could photograph these two examples. Usually I simply press the leg against a flat surface to see which side is best. Now I am ready to flatten the preferred side on the jointer. One of the benefits for my students is that the machinery I have is typical of that found is many amateur shops. My jointer, a 6″ model by Ridgid, is not ideal for jointing a leg of this length since the beds are only 22″ long on either side of the cutter head, so I have had to develop strategies to get a good result. A professional shop might have a 12″ or even a 16″ jointer with a bed long enough to get the entire length of the leg on the table on both sides of the cutter head—jointing using a machine such as this would be much simpler, but students usually don’t have this type of equipment. 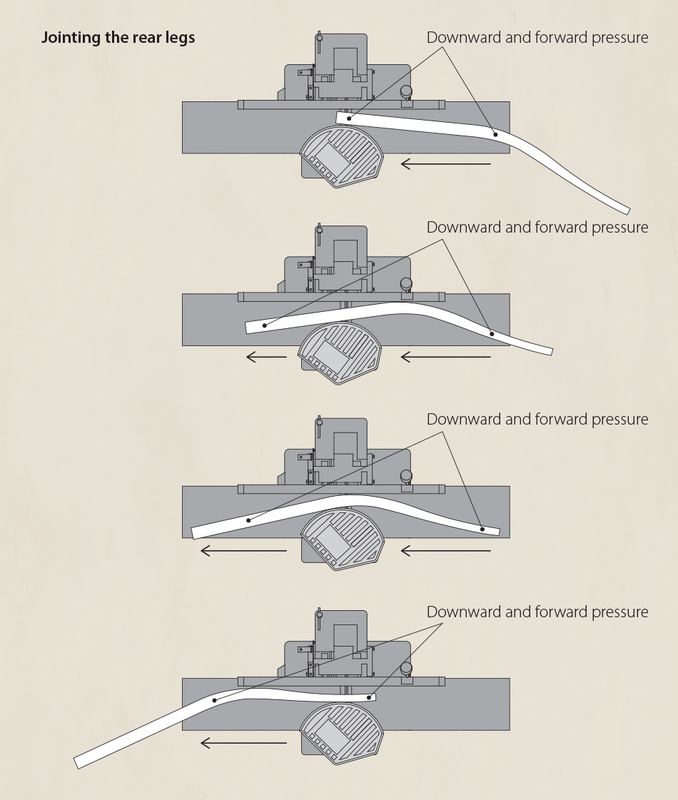 This series of illustrations shows the process I use when jointing. The jointer can be a dangerous tool so be sure to use appropriate push blocks that will keep your hands safely away from the cutter head and follow the manufacturer’s safety instructions. I like to start with the bottom half of the leg leading into the cut because this end of the leg is wider and more stable. As I pass the leg over the cutter head I change the position of my hands so that downward and forward pressure is applied across as much of the length of the leg as possible as shown in the steps below. Depending on the initial flatness of the leg it usually take two or three passes to flatten. With a very twisted leg it can take even more. Remember that the leg is 1/4″ oversize so there’s quite a lot of extra material to work with. Once I have flattened one side I label it with a “J” so I know it is the jointed side. The next step is to thickness both legs down to the final side-to-side dimension of 1-5/8″. With the jointed side down I pass each leg through the thickness planer. After each pass I turn the wheel a half turn (1/32″) and make another cut. 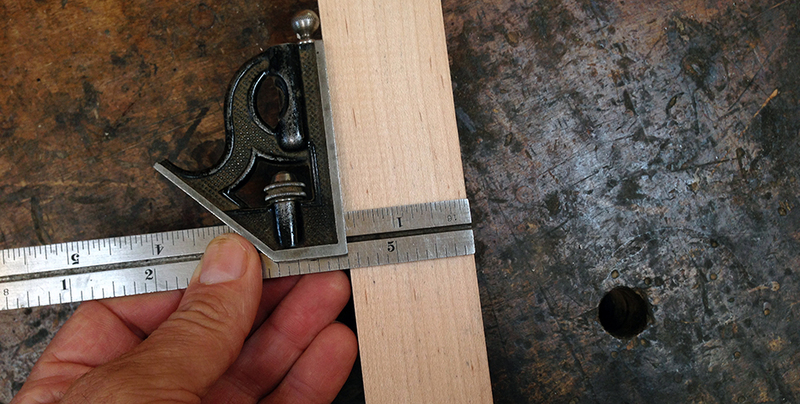 I measure my progress with a combination square set at 1-5/8″ and stop when I reach final thickness. This next step may sound simple, but as with most of the processes in the making of this chair, it involves subtleties that are worth paying attention to. The primary issue is that the legs are curved and it’s possible that they may have slightly different bends. A small difference in bend can affect the length of the leg as measured from bottom to top as shown in the illustration below. This in turn can have the effect of one leg appearing taller than the other in the final chair. This is especially important if I am working on a set of chairs and I want a consistent visual appearance from one chair to the next. So I can’t simply trim equal amounts off the top and equal amounts off the bottom of each leg since this will not account for any differences in the bend. 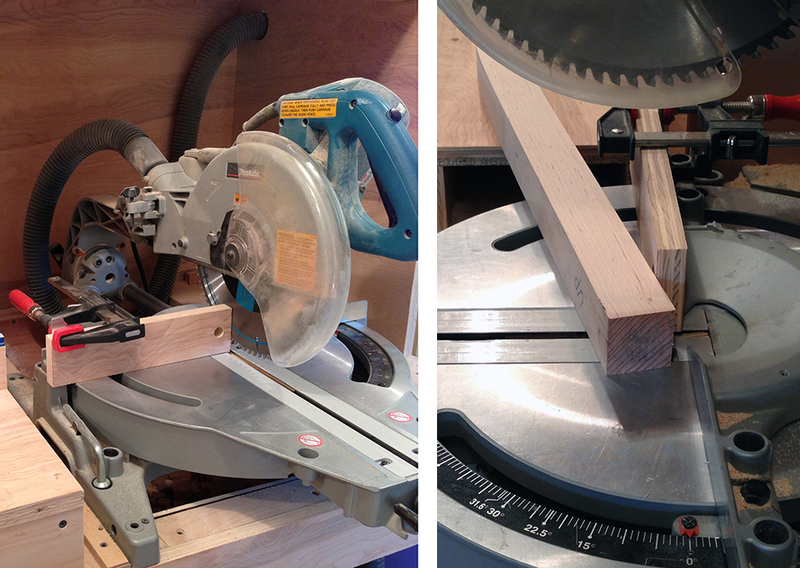 To deal with this issue there is a method for cutting curved parts to length on the chop saw. I begin by setting a stop at 42-3/16″ relative to the blade set for a 90° cut. Next I place a small block against the fence and the stop. Then I clamp another block to fence so that it’s touching the blade as shown in the photo on the left. These two blocks can vary in length but should be the same thickness. The purpose of these blocks is to keep the cut-off from touching the right side of the fence as shown in the photo on the right. This is extremely important for making a safe cut. If the cut-off contacts the fence during the cut the blade will bind causing kick-back. To reiterate, there MUST be a gap between the end of the leg being cut and the fence on the right side of the blade. Finally rotate the blade to an open angle of 103°. Here is the saw set up and ready for the first cut. Place the top of the leg against the stop and hold the bottom of the leg against the block next to the blade. Make the first cut. This will trim about 1-1/4″ off the bottom of the leg. After trimming the bottom on both legs move the stop 3" closer to the blade. This will put the stop at 39-3/16″ from the blade set at 90°. Keep the blade at an open angle of 103°. Place the bottom of the leg against the stop and hold the top of the leg against the block next to the blade. Make the cut. This will trim about 3-1/8″ off the top of the leg. Here are both rear legs jointed flat, thicknessed to 1-5/8″, and trimmed to final length. Those of you who were paying very close attention to the photos of the chop saw set-up may have noticed the old sign in the window behind and to the left of the saw. It very emphatically states in all capital letters “POSITIVELY NO DIPPING FOR MINNOWS ALLOWED. Dr. E. W. MILLER”. We found the sign in one of the outbuildings when we moved here more than 30 years ago. I believe Dr. Miller lived in our house during the 30s and 40s. There is a small creek in front of the house that nowadays has water in it some of the time. Back then it must have flowed all year round. I sometimes try to imagine what prompted Dr. Miller to go to the trouble and expense of putting up this sign. In my mind’s eye I see bands of marauding teenagers causing so much trouble dipping for minnows that it compelled action. Times have changed. In the next post I’ll use a combination of hand tools and a band saw for the two additional shaping steps required before the legs are ready for slat mortising.